So, you might already know, but the KVR DC 16 is finished, and I ended at rank #3 ! I would like to thank a lot all the people who have been supporting Spaceship Delay during the contest and who are still planning to use it, particularly the ones who helped me to make the Pro Tools version on Mac OS X in the forums or with Skype, or the amazing guy who worked during the KVR DC on a custom skin ! Thanks a lot again ! So the winners are Youlean with its Youlean Loudness Meter and Ursa DSP / Dave Elton with its delay Lagrange. It’s funny to see two delay plug-ins in the top 3 !! Youlean Loudness Meter is probably one of the best loudness meter that you can find for free, and I have seen a video comparing it with commercial alternatives. 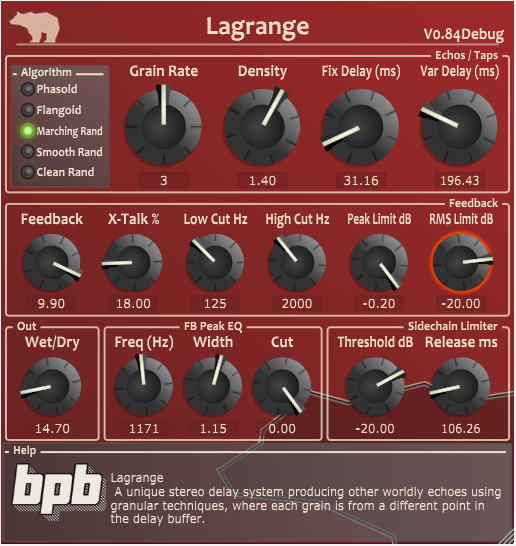 Lagrange is probably a less versatile delay than mine, but it is using granular methods to get very interesting and singular sounds that cannot be obtained with other methods, close to what can be got with stutter effects or some specific flanger / chorus effects. I suggest you to try them if you have not yet. And last thing, I have just updated Spaceship Delay to version 1.0.5. The new version includes a few things people wanted for a long time : mono/stereo versions of the plug-in for Pro Tools, Logic Pro X etc., a selector for the location of the Post-FX (before or after the mix control), a new tremolo Post FX and extra modulation options applied to the low-pass filters. There are also new presets and some extra tutorial content, so I suggest you to update your presets / tutorial folders as well. That’s it for today. I’ll probably talk again about Spaceship Delay very soon since I have big plans for it in the future !